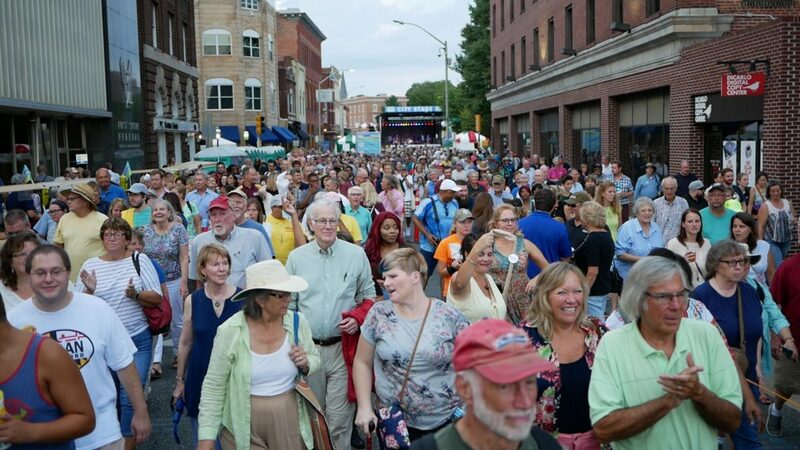 SALISBURY – Mayor Jake Day, National Folk Festival Local Manager Caroline O’Hare, and the National Council for the Traditional Arts are excited to announce that attendance estimates have been tallied, and the National Folk Festival in Salisbury, Maryland drew approximately 63,000 attendees in its inaugural year. Crowd estimates were made by analyzing a number of different data sources. To get preliminary crowd counts, images from cameras mounted at all stages and tents were used, as was drone footage. For the first time at a large event in Salisbury, the City’s Information Services Department used cell phone data to track unique ID’s, making for a more accurate headcount than was previously possible. “For the festival, we deployed an enterprise mesh Wi-Fi system across the entire footprint,” said Information Services Director Bill Garrett. “We had antennas at every stage, the Marketplace, the Family Area, and select other locations. The goal was to provide festivalgoers with a reliable, high-speed Internet service for use during the event. We were excited to see an increase in bandwidth usage of 1,750% compared to the prior 3 weekends, with the majority of traffic being to social media as people livestreamed and posted. “This system has an analytical component allowing us to track all users within range of the antennas. Even if the user doesn’t use our Wi-Fi, as long as they are within range the system sends a constant stream of offers to use our system. The mobile device, as long as Wi-Fi is enabled, reports that it received this offer. That lets us know the total number of devices in range at any time that were seen by the system.